We want you to know when changes are made to Boulevard. Not tomorrow, or the next day, but now. So where will you get this up-to-the minute news? Facebook, Twitter and through Support Center email notifications. Please Note: The instructions can vary and change as Facebook makes changes to their policies and layout. The most important is to ensure that you set it to follow and See First in your news feed. 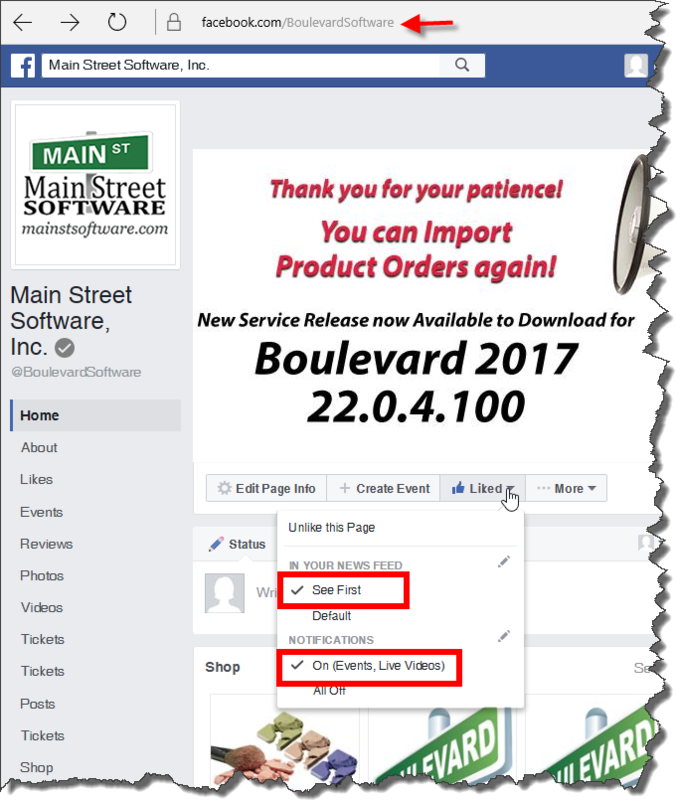 From the Like button, choose the See First option under the IN YOUR NEWS FEED section, to tell Facebook you want to see Boulevard news first. Also, under the NOTIFICATIONS section, ensure On (Events, Live Videos) is selected. On a computer, click the following link to go to our YouTube channel or search Main Street Software on YouTube. Click the Subscribe button and if necessary, log in to your YouTube account. On your mobile device, open the YouTube app. Tap the account tab . Click the Subscribe button .